Boost the speed and capacity of your home Wi-Fi network with the Nighthawk AX4 4-Stream AX3000 Wi-Fi Router from Netgear. Capable of up to 3 Gb/s of total Wi-Fi throughput, this dual-band Wi-Fi 6 (802.11ax) router supports OFDMA technology, which allows the router to transmit data to up to 16 devices simultaneously. Equipped with two external antennas, the Nighthawk AX4 features four Gigabit Ethernet LAN ports, one Gigabit Ethernet WAN port, and a USB 3.0/3.1 Type-A port that's ideal for sharing storage devices, printers, and other USB devices. Four spatial streams help to ensure smooth HD and 4K video streaming, while support for 160 MHz-wide channels allows for up to 1 Gb/s data transmissions to compatible mobile devices. With technologies such as Orthogonal Frequency-Division Multiple-Access (OFDMA) and intelligent scheduling, Wi-Fi 6 helps to boost wireless network speed, reliability, and capacity. Wi-Fi 6 supports most current Wi-Fi devices and is backward compatible with Wi-Fi 5 and earlier-generation devices. Ideal for very large homes, high-performance and pre-optimized antennas are designed to amplify Wi-Fi signals for maximized range and reliable coverage. Four spatial streams, including two in 2.4 GHz band and two in the 5 GHz band, help to enable streaming HD and 4K UHD content to more devices at the same time. Using the uplink and downlink Orthogonal Frequency-Division Multiple Access (OFDMA) feature of Wi-Fi 6, Wi-Fi traffic is managed more efficiently since data is transmitted from different devices concurrently, rather than forcing each device's data to wait for its turn. This allows the router to transmit to up to 16 devices at the same time, resulting in a more efficient use of airtime, reduced latency, and increased bandwidth. Designed to transfer multi-gigs of data. Full-packet processing offload helps to ensure zero load on the CPU. Allows for smoother 4K UHD streaming, online/VR gaming, and a stronger, more reliable Wi-Fi experience. More processing power also helps to boost your smart home connectivity. Capable of 25% increased data efficiency and faster speeds than a 256-QAM router. Allows for faster streaming, backup, wireless printing, and easy access to your stored media. 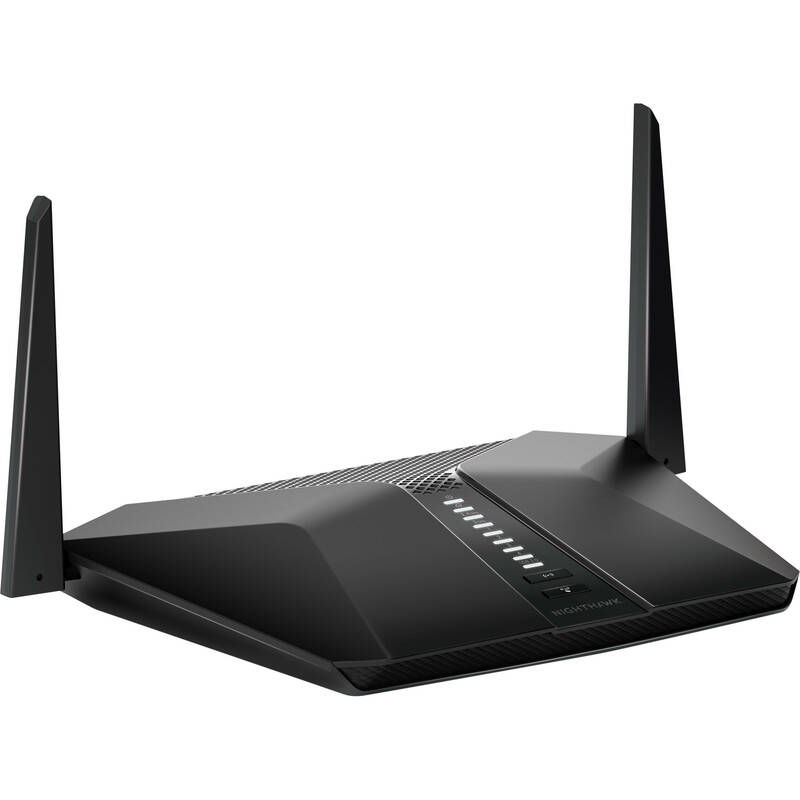 Helps to boost range and performance by allowing the router to direct Wi-Fi signals toward nearby wireless devices. Doubles the available bandwidth and helps to provide a reliable, dedicated Wi-Fi network for smooth online gaming with a minimum of network congestion. Makes it easy to set up your router and get more out of your Wi-Fi. With the app, which is available for iOS and Android, you can install your router in a few steps: just connect your mobile device to the router network, and the app will walk you through the rest. Once set up, you can use the intuitive dashboard to pause internet access on your connected devices, run a quick internet speed test, and more. Control your network with simple voice commands. On macOS, Windows, and on iOS & Android with the OpenVPN Connect app, securely access your home network & Internet connection from your mobile device remotely. Create a separate and secure network for your guests. Delivers latest security patches to the router. Box Dimensions (LxWxH) 15.5 x 10.0 x 5.0"